My grandma sent over some Christmas presents recently, and I fell so in love with the paper on one (above) particular gift, that I needed it on my nails immediately! 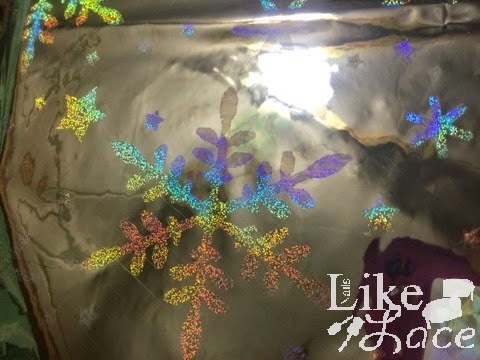 It's a silver-on-silver, reflective-base, holographic snowflake print. I already knew the perfect polishes to recreate this design on my nails too! OPI Push & Shove (chrome), and Color Club Harp on It (holo silver). I switched up my ring finger and thumb as an accent, and used the holo base with chrome snowflakes. The design was pretty difficult to see in person, but I was hoping it would photograph better. In my attempts to get a decent shot, I took about 100 pictures of this mani! I guess if you look at the closeups long enough, you can kind of tell what is going on. More so in the dim-lit pictures where the holo isn't as prominent. I think maybe there was just too much shine going on, or maybe my silvers were a bit too similar. Not enough holo to differentiate perhaps? I'm not sure, but it is definitely not as pretty as that gorgeous wrapping paper like I was going for, and looks like a double hot mess from further away, oddly. Usually messy manis look better from far away because you can't see the mistakes. In this case, it looks like some awkward, uneven, brushtrokey, lumpy, accidental two-tone, weird.... I could go on. This looks better the closer you get to it, and even that's stretching it. They can't all be winners! I may try this type of look again in different colors. I do like the idea of the monochromatic, holo snowflakes. Maybe holo over a creme base next time though? We'll see.